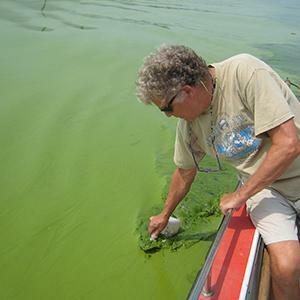 University of Oklahoma professors, Karl D. Hambright and Lee R. Krumholz, will lead a global research team to study one of the most common environmental problems–freshwater toxic cyanobacteria (bluegreen algae) blooms, which threaten freshwater lakes and pose substantial health risks to humans, pets, livestock and wildlife. The group will address the fundamental interactions between cyanobacteria and other bacteria co-occurring with the blooms. "By testing the hypothesis that cyanobacteria are supported through a mutually-beneficial relationship with a mixture of other species of bacteria, we hope to discover new avenues of bloom mitigation," said Hambright, professor in the Department of Biology, and director of Environmental Studies; and Krumholz, professor in the Department of Microbiology and Plant Biology. Both departments are part of the OU College of Arts and Sciences. The $2 million, five-year project, "Cyanobacterial Bloom Microbial Interactome as a Model for Understanding Biogeographical and Seasonal Patterns in Functional Biodiversity," is supported by the National Science Foundation.